Yesterday was a bit of a turning point. Since I don’t know when we had gotten a little bit lazy. We weren’t going to the gym three times a week anymore and we’d make lists and plans and just not follow through with any of them. Freya said she wanted to stay in and drink – and Mudslides were looking to be the likely candidate. On the way home last night we needed coal (so I could work from home next week) and we were supposed to go to the gym. Traffic was terrible and we were getting a bit fed up – the coal and the gym were probably going to get postponed – AGAIN!. Approaching Chiswick roundabout I thought – no! – stop it – get your finger out of your you know what at get the coal. So we got the coal. The gym was still debatable – but finger was out again and we went! And it was probably the best workout ever. I managed 2000 metres of rowing in 9 minutes – we did weights – treadmill – etc. It was very energetic and rewarding. What’s this got to do with eggnog? On the way home I said we needed a protein shake – and then we said we could probably add the protein powder to an egg nog. And the seed was sown for eggnog! Without the protein powder! We had this drink on Christmas Day and it was amazing. It was equally amazing last night. Even more special because I served it in my vintage 1950s Dorothy Thorpe Whisky glasses – which you’ll see often on Mad Men if you watch carefully. It’s quite labour intensive but well worth the effort. Separate two eggs, beat caster sugar into the yolks – and caster sugar into the whites until they are stiff. This took me ages! Then add milk, single cream, bourbon and spiced rum into the yolk mixture and gently fold in the egg whites. Serve with a grating of nutmeg. I used Kraken rum and Makers Mark bourbon – but only because that’s all I had. There’s 100ml of each in this drink so its quite potent for two drinks each! 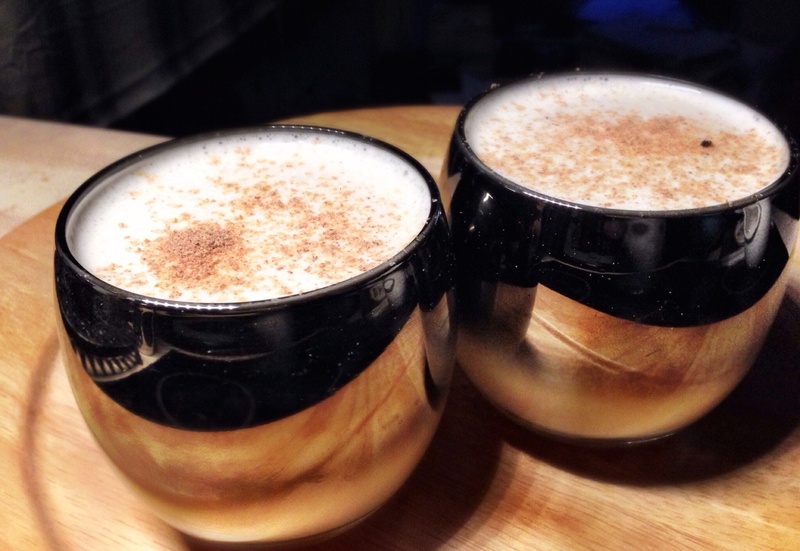 Much nicer than a eggnog latte from Starbucks – and I imagine cheaper too – even with all that booze!